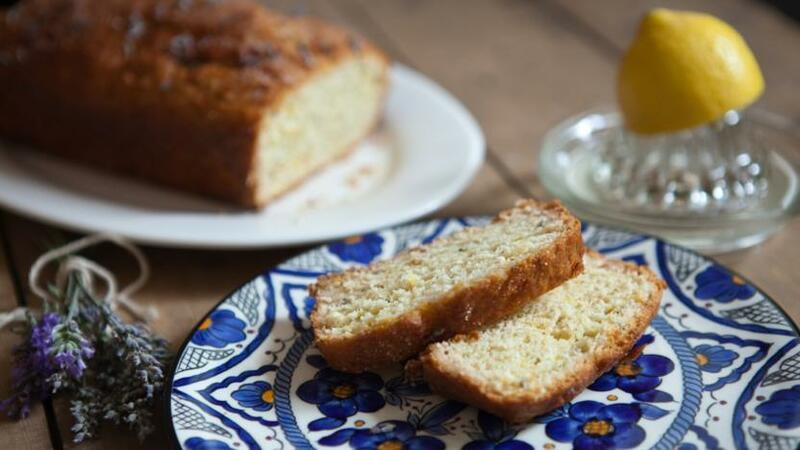 This is such a simple loaf cake - a variation on the classic lemon drizzle - and it works a treat. It has a wonderful, light texture, a very fresh taste and it looks incredibly pretty – perfect with a cuppa on a sunny afternoon. You can buy dried, edible lavender from baking suppliers and some supermarkets. Alternatively, if you have lavender growing in your garden, you can use fresh buds and leaves, finely chopped. Heat your oven to 180C/350F/Gas 4. Line a 1kg/2lb 4oz loaf tin (around 10x20cm/4x8in base measurement) with baking parchment. In a bowl, combine the flour, raising agents, sugar, lavender and lemon zest. In a jug, beat the eggs with the yoghurt and melted butter. Pour this onto the dry ingredients and, using a spatula, stir until just combined. Pour into the prepared tin and bake for 40 minutes, or until a skewer inserted into the centre of the cake comes out clean. Mix the ingredients for the drizzle together and pour over the hot cake. Sprinkle over the granulated sugar and then the lavender. Leave to cool completely in the tin before slicing.